After being accorded the 2009 Ibsen Award and traveling within and outside the country with this play, Theatre Painted Bird shall once again “slam many doors,” as Nora sheds her masks, casting off all the roles of mother, daughter and wife assigned to her by the patriarchy: Nora’s and Nûrê’s combined voices, which have echoed through Batman, Diyarbakir, Van, Dogubeyazit, Kars-Dagpinar, the Istanbul International Theatre Festival and the Ibsen Conference in Skien, Norway, are now ready to make themselves heard in Kumbaraci50, Istanbul on the 13th and 20th of October, then once again in the same venue on the 10th of November as part of the Pera Theatre Festival (Pera Fest) and also in the International Ankara Theatre Festival taking place between the 26th of November and 6th of December. “A Dollhouse” may be a play written by a Norwegian playwright in 1876, but the story of Norwegian Nora is not limited to that specific time and place only. It confronts us in a Kurdish classic, the tale of “Saliho and Nûrê”, carried on by dengbej – Kurdish story-tellers, the bearers of tales – such as Semdin, Karapete Xaco and Sakiro… When Saliho, Nûrê’s cousin and lover, gets jailed in Diyarbakir, Nurê goes and talks to prosecutors and judges, writes petitions and bribes judges so as to save him; but the moment Saliho is free, the first thing he does is kill Nûrê, right in the middle of the town, in front of the Grand Mosque (Ulu Camii); because, according to him, “Nûrê has not known her place as a woman and meddled with men’s affairs, trespassed into the male society.” “I shall kill you, because you dare appear in front of the government.” is what he says. By poking her nose into ‘men’s affairs’ Nûrê has dishonoured Saliho. 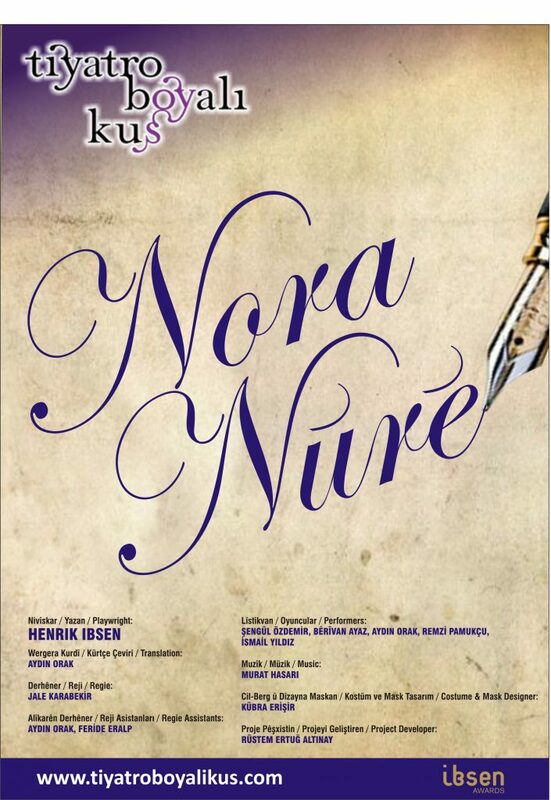 Just like Nora dishonoured Torvald… Nora/Nûrê. These two women not only share the same name – since Nora comes from Eleonora, the Latin word for light, while Nûrê comes from Nur, the same word in Arabic – but also the same story. Even though time and place may differ, this story of womanhood essentially remains the same. Today as well as in Nora’s or Nûrê’s day… Our aim is to express Nora’s, Nûrê’s and our own words and to tell these stories together within one play. All we strive to do is recount one tale in the language of the other and shed light on the universal story of womanhood.